Those prayer flags you’ve hung on your bike are not just some fancy accessory. Everything right from the color to the words on the flags has a deeper meaning. 1. 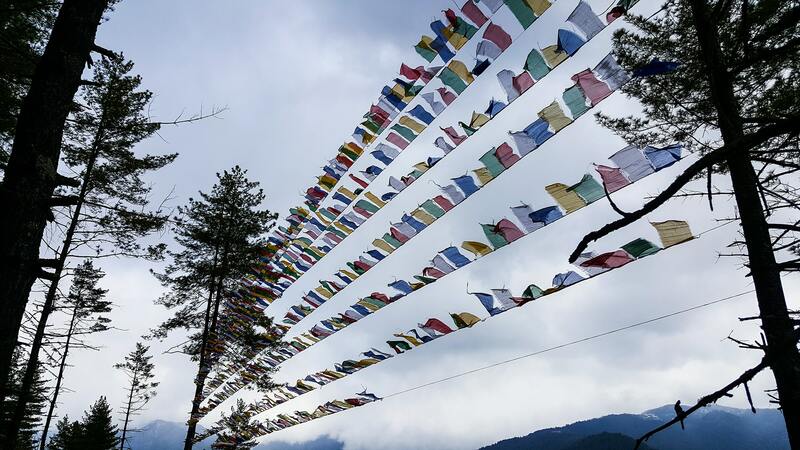 Darchen - These are narrow flags flown vertically on a pole and can be hoisted outside houses for protection. 2. Dar-Ding - These are long strings of flags hoisted horizontally between trees or pillars with five colored flags kept in a sequence. First comes the Blue represent Sky, Yellow is earth, followed by Green is water, Red is fire, White is air respectively. It should be a specific order. The Mantra is written on that flag is "OM MANI PADME HUM"
Hum – Spirit of enlightenment. Buddhist used to recite this mantra all time during pray time, It is said that if you recite the mantra during meditation, it can cure pride, jealousy, ignorance, greed, and aggression. It is commonly carved onto rocks, known as mani stones, or else it is written on paper which is inserted into prayer wheels. When an individual spins the Prayer wheel, it is said that the effect is the same as reciting the mantra as many times as it is duplicated within the wheel. Prayer Flag never should be Still and always hang in high altitude area. The reason why they are put high above the roof is so that they flutter in the wind. It is said that they emit positive spiritual vibrations and that the prayers are carried by the wind like silent prayers till the print of mantra on a prayer flag. Prayer Flag should be hoisted on a specific day. Prayer flags are hoisted on auspicious days like Sunday, Monday, Wednesday, Thursday, Friday and when stars are in an auspicious arrangement according to the Tibetan almanac. Colour fading from the flags is considered auspicious. This means that the prayers were carried by the breeze – fading colors are a sign of it. Mostly biker and some back of car hoisted Prayer flags because to prevent avert misfortune. Nowadays people can get prayer flag from anywhere shop like NorlingArts and Amazon.